This week I've been working on Kotton Kandy Kocktail a pattern by G. E. Designs Iceland called Strip Cocktail. It uses entirely 2 1/2" strips. I'm using Hoffman's Cotton Candy Bali Pop for this project. Oh I just love the lushes colors of these Bali Pops. This will be the third Bali Pop color I've used in projects. The first color was Kiwiberry; which became the name for my quilt project Kiwiberry from the Jan/Feb 09 issue of Quiltmaker Magazine that featured a pattern by Bonnie Hunter called Tropical Twist. The second color was Green Tea for as it turns out two projects, Kastanets and Kastanets' Kin. 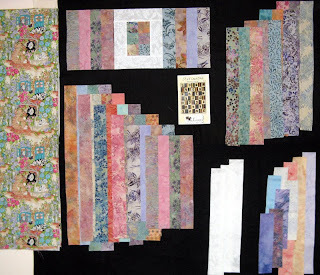 These projects were from a workshop taken at 2010 Road to California with Brenda Henning where we constructed her patterns Mood Swing and Linda's Twist. Linda's Twist used the scraps from Mood Swing which was pretty neat. I've got Bali Pop colors Butterscotch, Sherbert, and Berry Bliss yet to fondle. Berry Bliss is planned for my next project Katching Kisses, but that's another day's post. Back to Kotton Kandy Kocktail...here's a picture of the start. I used a black design wall for it since all the colors are light and as you can see they show up better against the black. The top center are the two block designs that alternate through the 7 by 8 row top that finishes without a border. To the right of the blocks are the strip sets that will be cut for the center of the block that is surrounded by white. Below the blocks on the left are the strip sets that will be cut for the second block design. Of course you'll recognize the white it has a very pretty lacey paisley design on it and the remaining strips at the bottom right are what is left from the Bali Pop plus some to be used for the binding. That big piece of fabric on the far left is the backing. So now it's time to cut some strip sets and get my Pfaff purring. Well here it is again the start of the work week. This is the long week of our 9/80 work schedule so it means working the Friday. I finished what I had planned to accomplish yesterday. I put sleeve and binding on two quilts just quilted this week; next comes the hand sewing as I much prefer the look over sewing them down by machine. Krossroads a Bonnie Blue Quilts pattern called Prommised Land by Paula Barnes and Kastanets' Kin a Brenda Henning pattern called Linda's Twist will soon be posted to my website www.kwiltnkats.com. Krossroads did require a purchase of the black fabric, but it was needed to pull all the scraps together. The borders were sewn onto Krumbs 1 a Bonnie Hunter pattern called Fun with Bricks and the back was pieced together for this fairly good sized project. I cut the back for Keeping Kool a 2009 Row Robin Exchange at Sunshine Quilters Guild that I'm a member. Now all I need to do for these last two quilts is cut the batting and take them to my quilter. I've been thinking about a binding that won't show on the front for Keeping Kool. I've seen this done before and I think it would look nice, but need to find out how it's done. For my design wall posting here's Krumbs 1 and Keeping Kool. All four quilts used up my stash yipee! I have a new project on my table now that will use the scrumptous Hoffman Bali Pop, Cotton Candy. I'm just getting started with my Stash Reporting for 2010...so my numbers look very different from those who started earlier this year. Hey, one has to start somewhere, right? Let me tell you though I have an estimated 1,044 yards of fabric in my stash. I've estimated my stash by weighing it. According to my home scale one pound comes to four yards of fabric (no I don't have a scale that displays to the ounce, please!). Between the 11 tote pans that hold my stash I have 261 pounds. Just doesn't seem possible. I'm not sure where you draw the line in calculating ones stash because I didn't include my Stash User's containers of useable strips in various sizes from 1.5" to 6.5" (must I?). Well I think I'm a little overwhelmed after doing the math, but let me tell you I'm extremely committed to using my stash. Well enough talking it's time to sew! My first blog posting. I've thought long and hard about starting a blog...but wanted to participate in the Sunday Stash Report that is hosted by http://www.patchworktimes.com/, Judy. 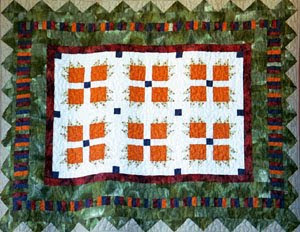 I first learned about Judy's "reporting" through Kathie http://www.quiltsbykathie.blogspot.com/. Need I go into a level down....NOT! I'm not certain how often I'll post a blog, but I want to participate in the Sunday Stash Report. Sundays for certain there will be a post. A little on me....I've been a quilter since 1999. I wanted to fill up space in my newly acquired home and cost for the large walls was way more than my budget could handle. Needless to say I took my sewing skills to advantage. I shifted focus from clothing to quilting and created my first wall hanging. It continues to be displayed eleven years later, as you enter my home. It was made from the Quilt in a Day pattern Bears in the Woods. Not the best of photos, but at the time I didn't know better! Time has passed and lots have happened in my quilting world. I belong to three quilt guilds; been chairperson for Project Linus in one for several years, President in another, and a big contributor in the third. I've been published several times in Quiltmaker Magazine and honored to have been selected to participate in the Road to California Quilt Show. I've taught at a local quilt shop, Memory Lane and made quilts for fundraisers that include Make-a-Wish Foundation, American Cancer Society, San Diego Humane Society, American Legion Auxilary, Alzheimers Association, Operation Homefront, and America Supports You. I've also donated quilts to the Veterans Administration, National Children's Home in the United Kingdom, Quilts 4 Cancer, and of course more than I can count to Project Linus. Besides the many gifts I've made for family and friends, I've also accepted many commissioned quilts. If you have the time and interest visit my website at http://www.kwiltnkats.com/. Here is where you can see all my quilts, well most of them since my quilting passion was launched in 1999. I hope my blog is of interest as I've found that so many are. I'm always looking forward to the next quilting adventure.